We have covered a lot of whisky news in the past couple of weeks with Lucienne's Feis Ile report, and my roundup of special new releases from the festival and so on, however, on offer at the moment is a slightly more attainable and affordable dram. 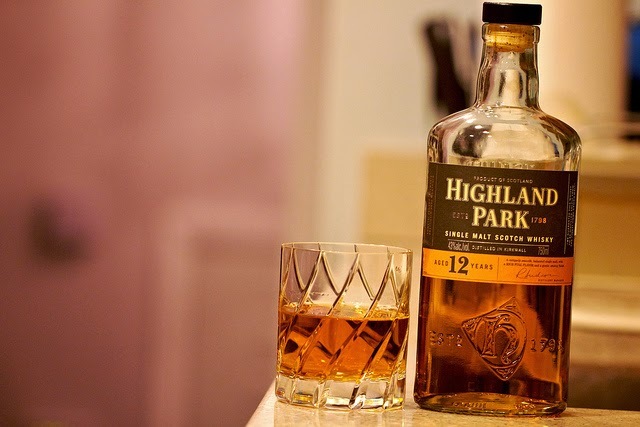 Highland Park 12yr is on sale at the moment at Tesco for £25 a huge, gigantic, whopping and tempting £7.90 saving! Highland park is a very popular distillery at the moment, they produce great whiskies at all price brackets and produce some really cool limited editions such as the Valhalla collection. The distillery is the northernmost in the UK and their whiskies are generally notable for their rich and full flavours with just the slightest touch of smoke. Not too far back, well 10 months ago now (how time flies) I reviewed one of Highland Park's travel exclusives Einar, which was really good, however, it's the 12 that first draws the punters in and sets them off on the winding road to fanboy-dom. On the palate the 12 yr is firstly sweet with the tropical fruit coming through quickly. There is nutmeg , jasmine, toast, and a slight sourness that helps battle the sweetness in this whisky. It's wonderfully balanced, smooth and soft with great depth. It finishes with the smoke and oak coming through with pepper that adds more dimensions to this subtle and refined dram. The Highland Park 12yr is really quite interesting in that it ticks a load of boxes: it is sweet, but has sourness and spice; and it's very easy drinking, but with complexity and has even more interesting elements in the peat, oak and sherry that come through. This is a really great whisky for the novice or for a long-term drinker - it really has something for everybody and is a great introductory whisky if you wish to demonstrate a wide variety of different flavours.